Anthony's upper front-left tooth is very loose, just hanging on by a thread (so to speak), so I expect it to fall out today or tomorrow. [UPDATE: or the day after tomorrow.] He's never had a baby tooth fall out naturally, though six months ago, we did have two baby teeth pulled by a dentist. 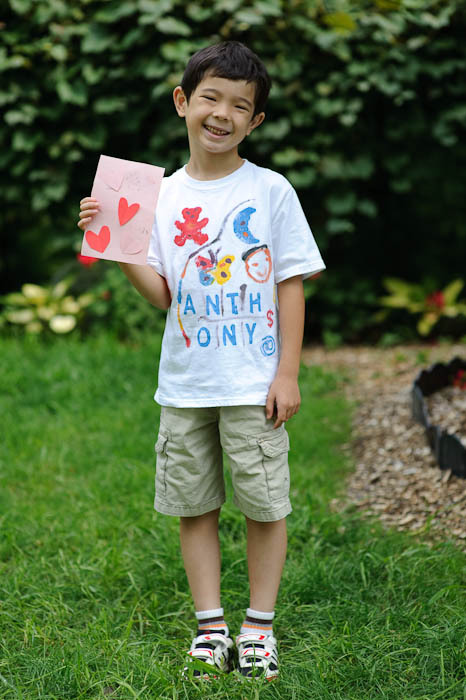 He posed this morning in a T-shirt he made with his Aunt Natalie the other day, holding a card he spontaneously made for Mommy yesterday (which I asked him to hold for the picture because Mommy will be able to see the photo on my blog before postal mail reaches Kyoto). Fumie misses us while we're visiting The States, but she knows it's important for Anthony's English, and for his American culture. But I told him that she'll have mixed emotions about his tooth falling out, that on one hand she'll be so proud that he's growing up, but sad that it's while we're away traveling. We’re going to Himeji in a couple of days for the same reason. Not that you needed to hear it, but…. you’re doing the right thing by having your son spend immersive time in the States for English. 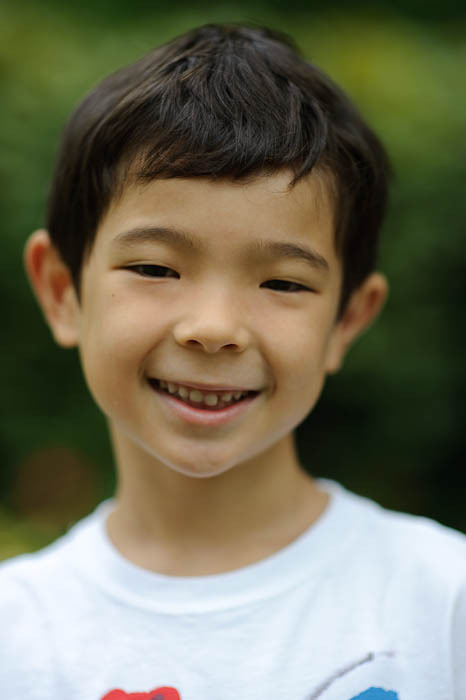 Last year before we left for Japan I’d show my son pics of animals and ask him to say their names in Japanese to which his reply was, “Daddy, I don’t speak Japanese, anymore.” But after that one month in Japan his Japanese was back with a vengeance and has not abated. I’m sure its not as good as it would be if he lived there, but its amazing what a summer abroad can do. How is your son’s English? BTW, I’m not sure if your family cares but Anto’ looks really Japanese in these photos. My wife LOVES when our multi-racial child’s features seem to favor the J-side. I noticed you are shooting with an 85mm 1.4 Nikkor. Is this new or do you just rarely rarely use it? I usually check out the metadata at the bottom of each picture and it seems like 8 times out of 10 it’s the 70-200mm and the rest of the time it’s the 24-70mm. I’ve never seen the 85mm down there before. On another note, since you are shooting FX are you looking into the new 70-200mm that is supposed to be better on the FX bodies?